"An elegant solution to a tremendous problem. 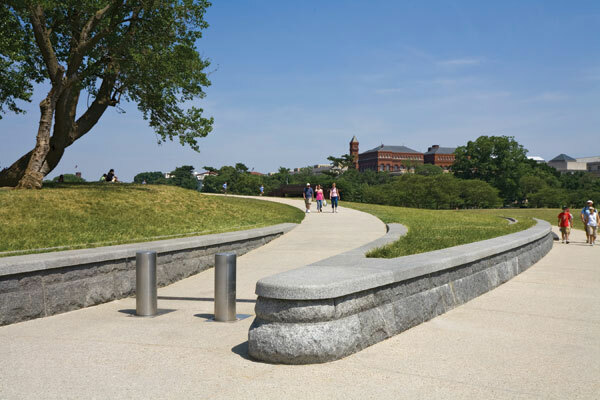 The landscape architect has put the focus back on the monument and provided security through gentle grading and beautiful amenities, like trees and seating. The resolution of the geometry is very simple and sophisticated." 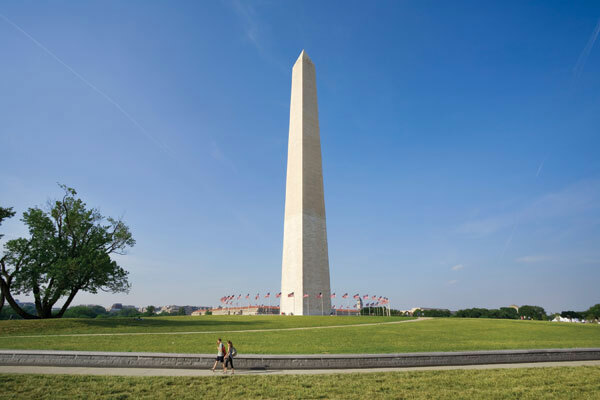 PROJECT STATEMENT: The revitalized Washington Monument articulates the site’s character and identity within the context of the National Mall and demonstrates the art and craft of landscape architecture in a very prominent place. The design is bold and clear; a minimalist solution that turned a project originally funded to prevent terrorism into a handsome civic amenity. It is proof that the union of sound security and artful design is not only possible, but can be functional and graceful. 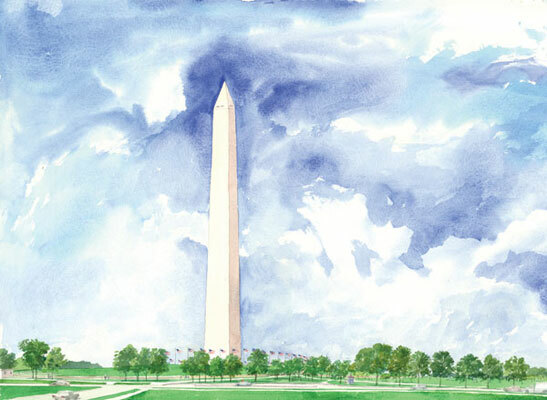 PROJECT NARRATIVE: The Washington Monument is an icon of American freedom and democracy. Its 72-acre grounds play a vital cultural role, providing a public space for demonstrations, celebrations, entertainment and recreation for millions of people each year. 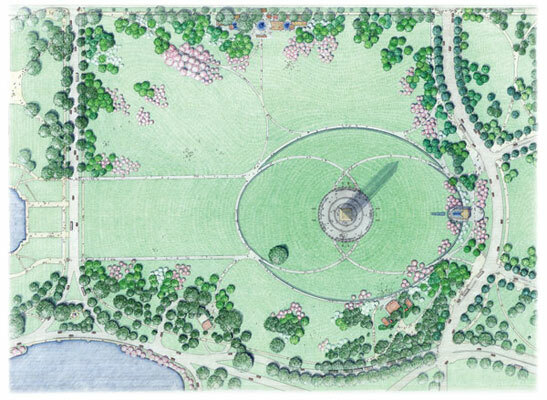 A need to upgrade exterior security provisions came to the forefront after 9/11, leading to an invited design competition for the Monument grounds. The landscape architect won the competition with an elegant security solution, and in the process, successfully proposed much needed landscape improvements. 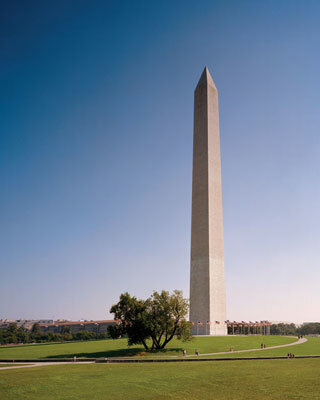 The Washington Monument grounds had become unattractive and the Monument was left standing in a disrespectful and unacceptable physical setting. The grounds consisted of an irregular and poorly-graded hill with struggling eroded grass, cracked concrete and asphalt drives used for walks that ran straight up the hill violating contemporary standards for accessibility. A poorly-designed and disfiguring concrete block hot dog stand had been built against the historic Monument lodge on the central axis toward the United States Capitol. A surface parking lot marred the view on axis with the White House. Huge bunkers on each of the compass points housed outmoded search lights for evening illumination, providing both a blinding hazard and huge clouds of insects at the ground near the Monument. The concrete Jersey barriers and squad cars ringing the Monument part way up the mound contributed to the ground’s ills. From the outset of the project, the design intent was to determine how best to turn an anti-terrorist defense project into a welcoming civic space. The history of the site, its dimensions and proportions, circulation routes, and research regarding contemporary vehicular barriers and bomb blasts were intensely researched. 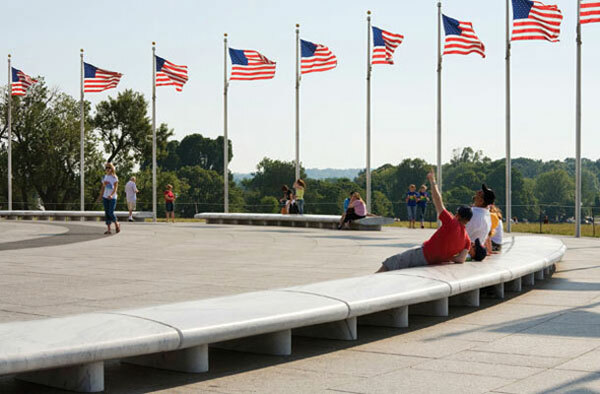 Since the Monument sits atop a significant hill, disabled access was also studied. In addition, traditional, unobtrusive fencing and barrier designs of 18th century European estates were considered for their effectiveness as physical deterrents. Landscape architects have designed barriers for centuries. In 18th century England and France, sunken walls were frequently employed to prevent livestock from gaining access to country houses and chateaus while providing visual continuity. 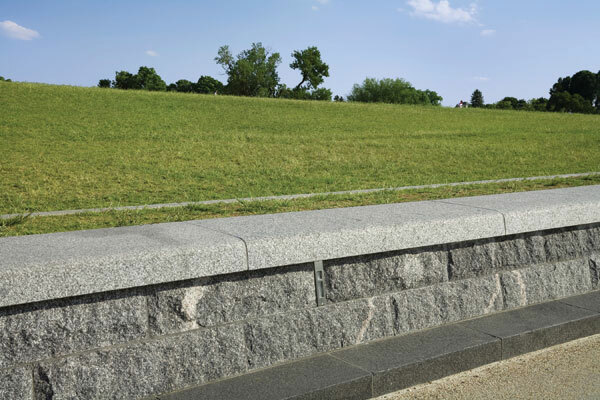 It was also noted that Olmsted and Vaux had used low stone walls to resolve grading issues and direct the movement of pedestrian and horse-drawn vehicles at the United States Capitol grounds. Deploying a combination of these two strategies, a scheme was developed. The design brings resolution to the landscape deftly. Representative of this are the low 30-inch granite-finished walls. The curving walls are configured in a graceful pattern appropriate to the spirit of the Mall and the Monument. They safeguard against automobiles and trucks entering the site and also provide a resting place without distraction from one’s view. Concrete paths were reconfigured, graded and replaced, providing more secure pedestrian circulation while additionally enhancing the site’s beauty and disabled accessibility. 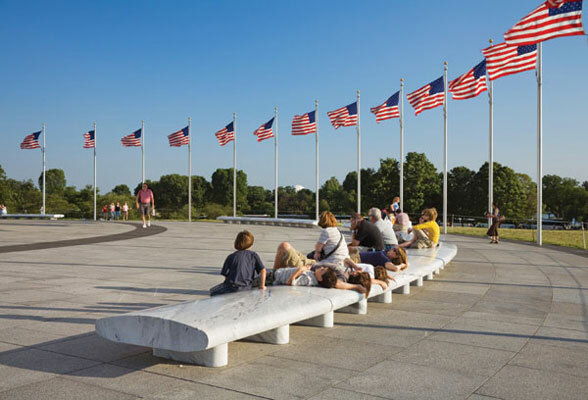 New plantings, lighting, furnishing and a granite-paved plaza at the base of the Monument breathe life into the visitor’s experience and foster interaction with the iconic memorial. The unfortunate concrete block addition and surface parking lot were removed. 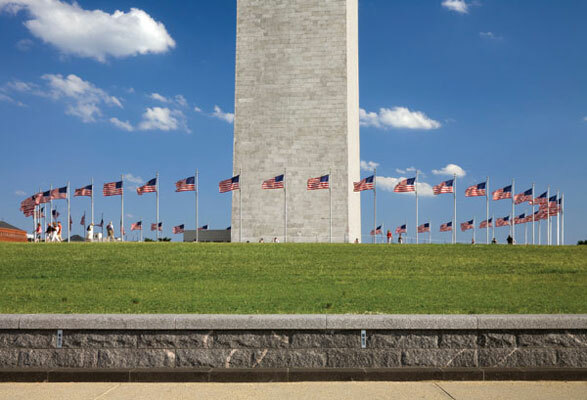 Given that the Washington Monument is the most iconic and abstract of all memorials in the Unites States Capitol, the landscape architect set out to do the simplest, most minimal solution. One conclusion was there were to be no vertical lamp poles (there were already 50 flag poles) or railings. Thus, lighting for the Monument is either remote or in the ground. At the top of the low security walls that surround the base of the hill, a broad raised warning band with a light stone edge calls out the drop for visitors wandering down the hill. It also catches water leading it to drains to prevent it from eroding or causing a problem with lateral pressure in the walls. Because several points of the wall face areas for festivities and informal recreation, such as the traditional softball leagues of nearby government employees, a small curb was placed at the base of the wall to serve as a footrest for people sitting on the wall to watch games and other events. The curb also functions as a protective device from snowplows. The walks are laid out to spiral up and back down the hill making a quarter-turn as they ascend rather than progressing radially straight up the hill toward the Monument. The intent is two-fold; first, it provides ample length to achieve a comfortable and accessible ascension – i.e. less than a 5% continuous slope; second, to offer a changing and sweeping view ahead of the scene ahead. The grading for these walks ensures that they are not visible from a distance. 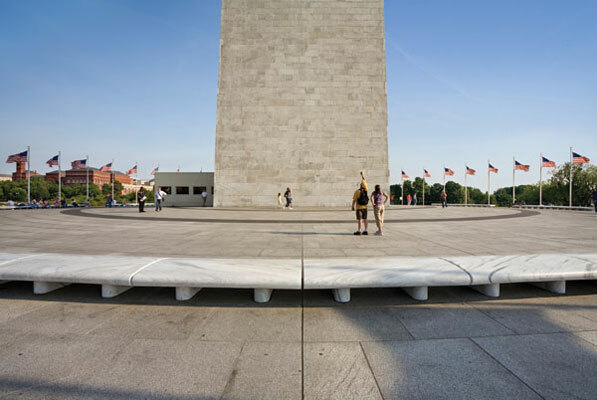 At the base of the Monument, a simple granite disk has been installed upon which are a series of elegant, low and broad marble benches without backs. The intent was to keep things as minimal and horizontal as possible, leaving only the Monument and the flag poles as vertical elements. 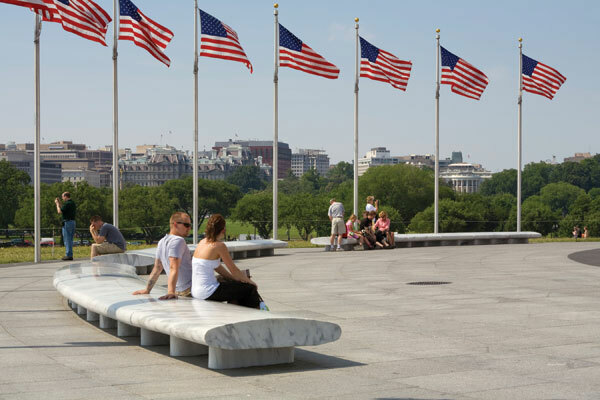 The benches are wide enough to accommodate large numbers of people, some of whom are in queues with timed tickets waiting to ascend the Monument. Others are resting, waiting for friends or family, or merely looking out at the surrounding monuments, city and landscape. 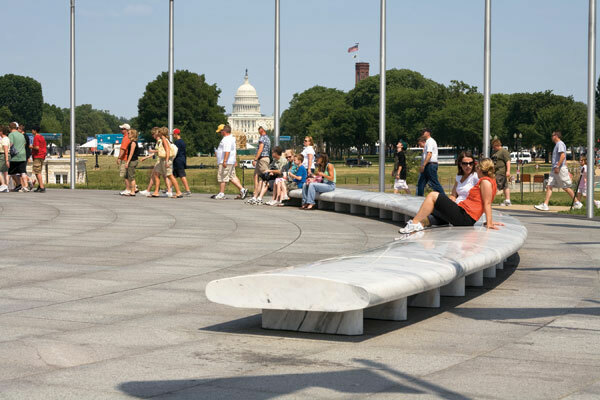 The benches are broad enough that people can sit back-to-back without infringing upon each other. 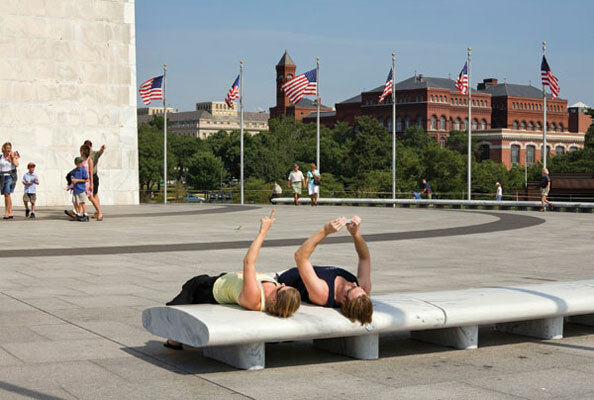 They can recline to look up at the Monument and sky. The result is safe, secure, handsome and welcoming. The regrading of the hill and the realignment of the pathways preserved the majority of the planting, including an ancient mulberry tree on the southwest corner. 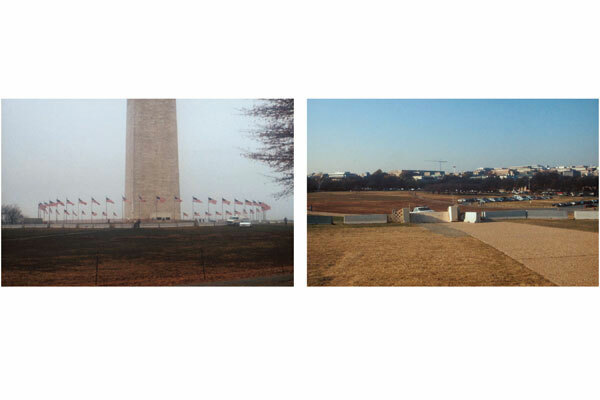 The regrading effort required major reshaping to aesthetically enhance the base of the Monument. An outdoor theater stage used for band concerts for several decades was also worked into the scheme on the south flank of the hill. During the design process, the landscape architect worked very closely with the owner. Not only were the opinions from the owner fully incorporated into the design, but comments from public meetings and review agencies were carefully addressed. The design of the landscape went through public reviews in collaboration with the National Capital Planning Commission and the Commission of Fine Arts, in addition to the owner. The grounds' special uses and activities, the presence of police and security personnel, budget, maintenance, and sustainability were discussed.